MyView Surveys is an invite-only site where you complete surveys for points. Points can be redeemed for gift cards like Amazon, Itunes, Walmart, GameStop, VISA and much more. You can also donate your points to charities, enter a sweepstakes or get one of their magazine subscriptions. They recently added a lot of new rewards that were suggested by members. A lot of these prizes are high priced and it takes awhile to accumulate enough points. They send about 3 or 4 surveys per day. Some days, they do not send any surveys. You get credited a small amount just for trying if you do not qualify for a survey. They have a referral program where you are credited 1,000 MVP when someone you refer completes their first survey. A $25 Amazon gift card costs about 35,000 MVP. Since this is an invite-only site, you can only sign up with the link above. 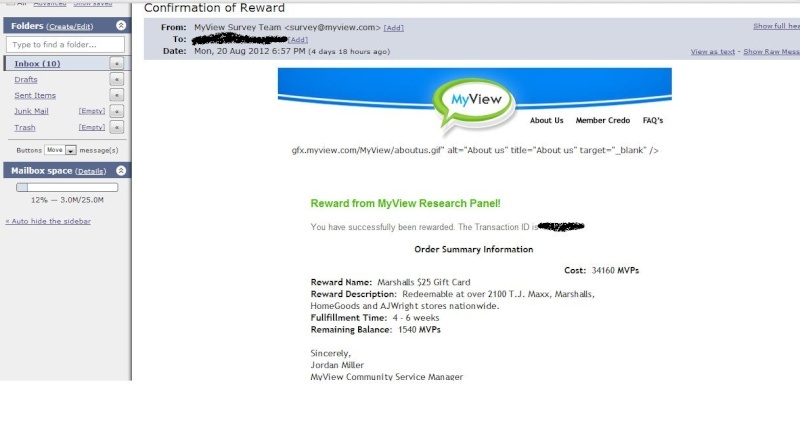 I have redeemed two $25 Marshall's gift cards and a $10 Best Buy gift card from MyView.